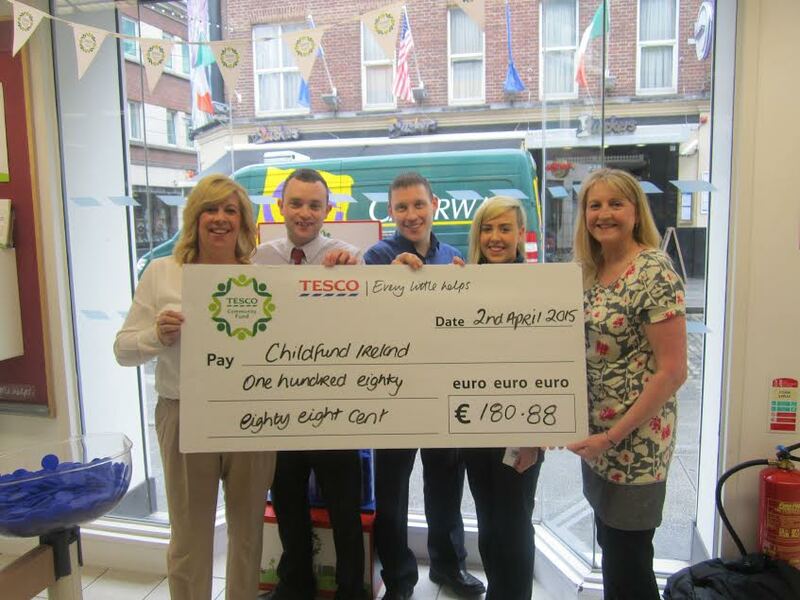 ChildFund Ireland was delighted to accept a cheque recently from Tesco, Fleet Street branch in Dublin, as part of their Community Fund Programme. Fiona Regan of ChildFund accepted the cheque for €180.88 which represented the monetary value of those Tesco’s customers who dropped their blue shopping tokens into the ChildFund chute. launched in July 2014, Tesco’s Community Fund Programme aims to raise donations of approximately 1 Million annually for worthy causes in local communities, around each of its 146 Irish stores. The token system puts the decision-making power in the hands of the public, allowing them to choose those causes that most strongly resonate with them. We are delighted that many of Tesco’s customers chose to donate to ChildFund, recognising the vital work we do in protecting children and advocating for their rights. Thank you once again to all the staff and customers in Tesco, Fleet Street.